When Apple's Watch first arrived, we couldn't help but notice that the first third-party apps on it were a tad sluggish. But that's because they were running on an iPhone and not natively on the Watch, as Apple's own health tracker and other apps do. That's about to change now, however, as Tim Cook just unveiled a new WatchKit SDK at Apple's WWDC 2015 event that opens up all the wearable's functionality to developers in advance of the Watch OS2 release this fall. That means app-makers will be able to tap the Digital Crown, health and orientation sensors, "taptic" feedback feature and more. Along with native apps, Apple also revealed a spate of new features coming to WatchOS 2. 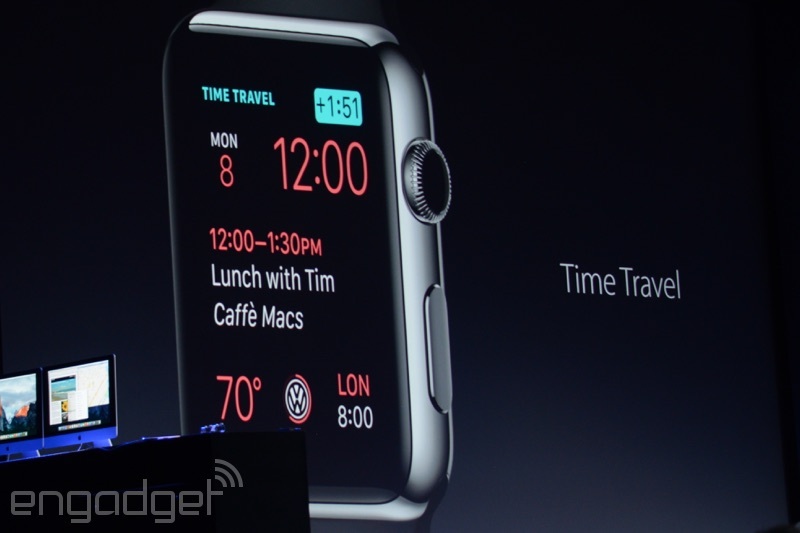 To start with, you'll be able to reply to emails directly from the Watch, assuming you don't mind the tiny screen. There's also a bunch of new watch faces, including a Photo face that can be customized with your own images, and a Time-lapse Photo face that shows the passage of time at spots like the Big Ben clock. 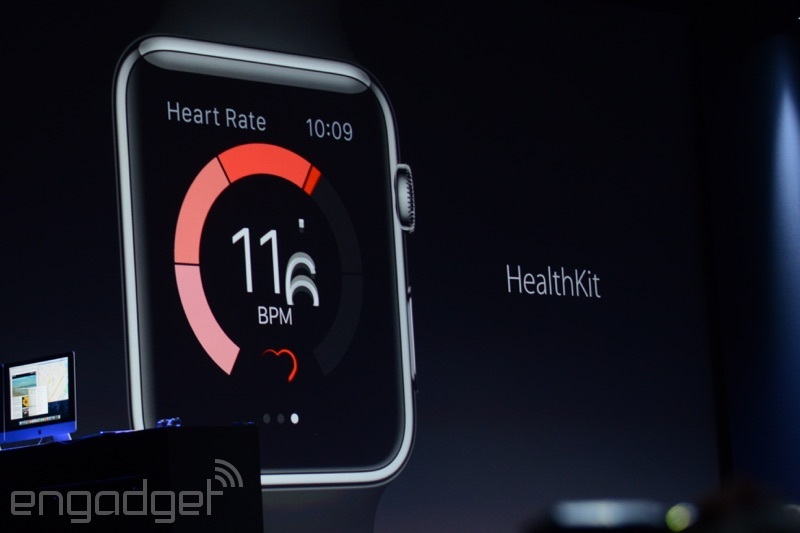 Watch will also include a portal-type area called "Complications." That'll put specific app features up-front, letting you see your United flight time, the charge status of your Tesla Model S EV or sports scores, to name a few examples. You can also turn your Watch into an expensive alarm clock when it's charging in Nightstand mode, with the Digital Crown acting as a "snooze" button. The Crown is also being put to good use for Time Travel, allowing you to fast-forward your calendar to see upcoming appointments. Apple also revealed an "add a friend" feature to help you find kindred Apple Watch spirits from the "Friends" menu, and then chat with them using the Watch's upcoming FaceTime audio capability. And the new Transit and Pay features on Maps? You'll soon be able to access those over your Watch, too. Moving along to health and fitness, as expected, third-party apps will run on the Watch without the aid of an iPhone, making it far less of a kludge for workouts. The wearable will also respond to Siri commands, so that you say things like, "Start a 300-calorie run" to begin a workout. Now, back to that new WatchKit SDK. Apple says that on top of making it faster and easier to build native Watch apps, it'll give developers access to all the device's bells and whistles. Health app-makers will be able to use the heart rate monitor, and sports trainer apps can tap the accelerometer to measure your golf swing, for instance. Another example would be car apps that use the "taptic" feedback to inform users that their doors are locked. 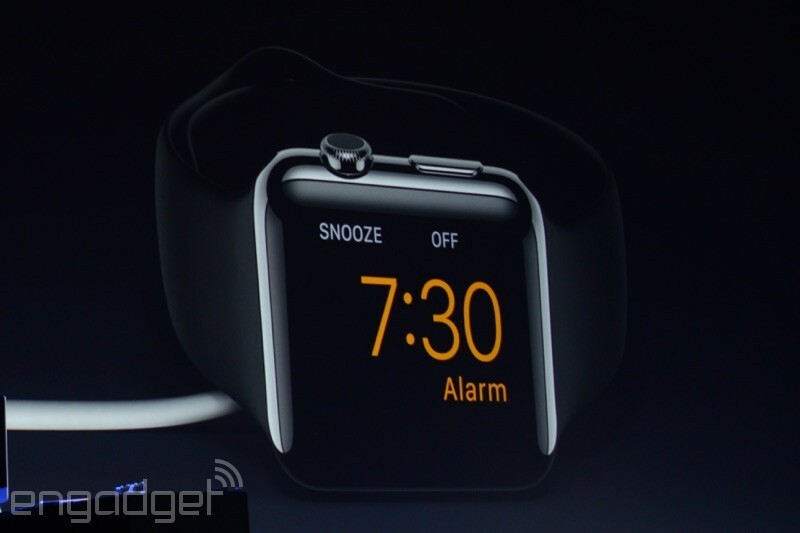 New apps will also get access to the device's microphone and even play "short-form" video on the Watch screen. To drive home the last feature, Apple's Kevin Lynch played a Vine video on the tiny screen, the first time we've seen that. So when is all this coming? You'll have to wait quite a bit to see the new tweaks yourself, as WatchOS 2 won't arrive (as a free update) until later this fall. However, at least developers will be able to get to work on new features, as the iOS 9 SDK beta, which includes WatchKit for WatchOS 2 is available immediately at Apple's developer portal.